I've noticed recently that a lot of people are still - even in this day and age - flabbergasted by the idea that there are men who knit. 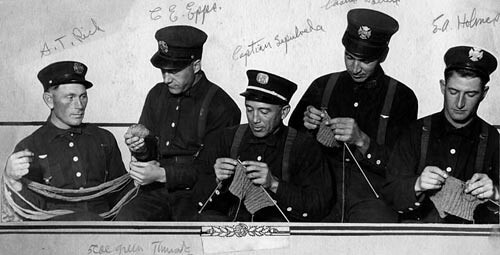 Anyway I'm only going on about this because it's an excuse to link to an amusing little blog post that I just read on Slip Slip Knit about men who love knitting. Last week my universe converged in an unexpected way when Knit Nation turned up at my work... in my very own office building. A place usually overrun with students and academics was suddenly awash with knitters. (For me it was a dream to watch the ground floor of my building get converted into a giant yarn store!) I also spent a few pleasant lunchtimes sitting outside with my newfound knitting homies. So... the universe clearly wanted me to purchase yarn, and who am I to argue? This is Knitwitch "Seriously Gorgeous" cashmere and silk, in 4ply weight. It pains me that I cannot post a touch-screen version of this photo, because the yarn really has to be felt to be believed. It is SOFT! The lighter shade is called Silver Seas, and is a pale, silver-grey with occasional streaks of aquamarine. The darker one is called Winter Sky, and is primarily a slate grey, with occasional streaks of deep red. Since I bought these I have spent quite a lot of time rummaging through books (and almost every 4ply pattern on ravelry) for a suitable pattern. I was seriously considering a lace pattern for one or both of these, until it came to me that the beauty of this yarn really lies in how it feels. I think it wants to be something simple. Then the fact that the two colours complement each other made me think about stripes. So with that I abandoned my pattern search and cast on 38 stitches.... and started striping. I am calling this my "Seriously Soft" scarf and I think it is going to be my favourite thing, come Autumn. Until then I hope it will make a good, mindless, project to work on while watching TV. A few rows in, I like the way that the stocking stitch curls in at the edges. I think this is the sort of thing I would wear at a weekend, when it is just beginning to get chilly, wrapped several times around my neck. Moving on... those of you who like to knit socks may be familiar with the German yarn phenomenen that is Wollmeise. Not being especially into socks, I was introduced to this phenomen at Knit Nation, when I saw 1000 crazed knitters go into scrum-mode at the Wollmeise stall. I think the craze is due to the amazing colours, and when I finally got near the stall, I could see why. We're talking about every colour of the rainbow, pure and bright... in 100% merino 4ply and lace weight. Very nice indeed... so I bought two skeins (Lavenden and Fuchia). No idea yet what I will do with it. Well that's all from me... will report back later when I've done something.